← What comes after Marvel: Age of Ultron? A while ago, Kevin Feige, currently running the phases of Marvels’ movies, has mentioned that Marvel will never go “GrimDark,” like the Batman vs. Superman trailer seems to be. As he said it, I discovered I had the perfect word for what’s happening with my tv shows. Seriously, multiple shows in my TV watching season, some of the better ones, have started going into … bleak, dark, utterly hopeless crap. I’m really kinda tired of it. 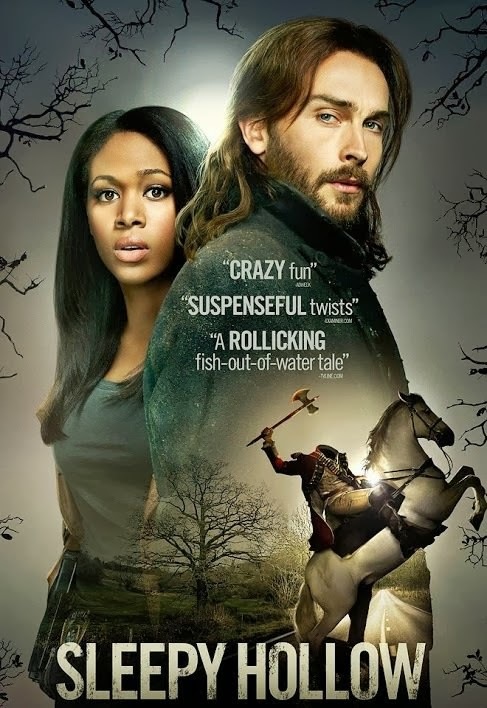 Sleepy Hollow: I gave up on this one early. No hope, every victory was Pyrrhic, and only served to help the primary demon behind everything. The characters were inconsistent at best. character shifts were all over the place, and obvious plot contrivances. For the first half of the season, John Noble (who does creepy very well) was the son of two of our protagonists. He works with a demon, Moloch, and he has mommy issues, daddy issues, as well as the leather-bound collected volumes. By about episode 10, with little to no provocation, he shanks Moloch with the deus ex Machina, and …. Wait, there’s more to the season? The entire series should be finished. Our hero’s wife, the witch, went from being bothersome (every single line had to be fraught and breathless), to interesting (she was a badass for two episodes), to tiresome (“Oh [gasp] we can redeem him [gasp],” please, lady, get an inhaler, your asthma is acting up again). And oh, yeah, then, with no motivation — literally, none, zero buildup or hints — she goes to the dark side. Huh? I haven’t seen a conversion to villain this unconvincing since Anakin Skywalker. You know how bad this is? Okay, she’s beautiful, until she opens her mouth. Arrow: Let’s ignore the fact that th ey stole the back half of the season from a Batman plot. Let’s do that for right now. The way they handled was just so utterly hopeless. It might even be possible that Starling City briefly became the city of endless night — I’ll need to replay the season, but the back half may not have seen the sun until the last episode. To start with, the midseason break led into a three-part storyline that was surprisingly epic in scope, that threatened part of the city, using a gangster who seemed damn near bullet proof. After a reign of terror, with all the sidekicks holding the line against an army of killers, the threat turns to the looming League of Assassins, with Ra’s al-Ghul wanting the Arrow to take over his position, and, later, marry his daughter … Because he really is Bruce Wayne at this point. Only not as good at making money. During the course of the season, Oliver Queen was outed as the Arrow by Ra’s, only to have his sidekick Roy Harper give a false confession. The cops know Queen is the Arrow, but they’ve got a confession. Then, to get out of it, Roy fakes his death. Eventually, Queen ends up joining the League of Assassins later on for different reasons. So, from the point of view of the writing staff, what was the point of Roy’s fake death? Oh, yeah, the actor’s leaving the show. And as Oliver Queen joins the League of Assassins, it only gets darker from there. Brainwashing. Turning on allies. Murder of likable characters. It’s just dark, bleak, hopelessness all around. Welcome to the GrimDark. The last episode made up for it, but that literally had a happily ever after, driving into a bright, bright sunrise. You know it’s bad when the people who made the show had to make an announcement that the next season will be brighter. Person of interest: Again, in the back half of the season, this has just been one damn thing after another. A long-term team member is presumed dead, then kidnapped, then possibly tortured and broken, then the evil massive conspiracy that have been the adversary this year has been winning … and winning more … and winning more … And now, they’ve all but won. The season ultimate episode of the season ended like Butch Cassidy and the Sundance Kid, and our heroes have only a wing and a prayer, all their allies are in serious trouble or dead. Grimm: This could have been an easy Buffy ripoff, but the series has turned into an interesting world, that keeps expanding. It makes me wonder if they’re making it up as they go along, or if they had it outlined, and they’re just showing it to the audience a bit at a time. But … what the hell went on this season? Good news is that we’ve had what feels like two seasons worth of plot into one. The season started with our hero having been de-powered, he’s relying on a fellow Grimm (a fellow Slayer, if you’re a Buffy fan), to aid him in his fight. At the same time, there is a Klan-like group are after friends of his. This could have gone on for a whole season, really. But halfway through, our hero gets his powers back, the sidekick goes off into the ether, and we’re good…. except our hero’s girlfriend has been turned into one of the beasties. Oh, yay. Even better, it’s one of the more higher-powered creatures, and she’s going evil … or completely insane. This gets better and better, don’t it? Now, while this could have gone on for a whole season, with a decent into madness and going to the dark side. But it was nicely condensed, and actor Bitsie Tulloch pulled off a delivery that made you wonder if her character was really going evil, or just going crazy, and if she was going to be redeemed, or put down. And, given that no one in the primary cast has died thus far, I’m not writing her character off just yet. … Come to think of it, Tulloch is another redhead. Which makes me wonder when this season declared a war on redheads. These are shows I’m still watching, but Arrow has got to stop stealing plotlines from Batman, Sleepy Hollow should stick with the creature of the week, and Grimm has to get rid of at least one or two recurring characters (a blonde who happens to get pregnant a lot, for example). You know it’s bad when the tv show Stalker (the opening scene of which was someone being set on fire) was more cheerful and optimistic this season than some of these. This entry was posted in Analysis, Commentary, Fantasy, Fiction, Reviews, Science Fiction, Superhero and tagged Arrow, Batman, Batman vs. Superman, Buffy the Vampire Slayer, Butch Cassidy and the Sundance Kid, Grimdark, Grimm, Person of Interest, Sleepy Hollow. Bookmark the permalink. “REDHEADS HAVE NO SOOOOOOOOOUUUUL”. Or, something. Maybe too much South Park? Maybe the “wow, the writing is so great this past few years” was too much pressure, and they had to up the grimdark to impress us with their depth. Did not see that coming with POI. I mean, part of it may be a reflection on how the writers see real life going. Sleepy Hollow second season was reading too much of their own great press reviews and trying to “ramp up” the excitement. I thought Katrina was a whiny, manipulative wench from day one. I even speculated online that she used her powers to force Crane to fall in love with her because he would be more useful as a spy than Abraham would be, and easily to twist. I think the GrimDark is a reflection of the lack of spiritual hope Hollywood has. If all you see is the tortured soul and no eventual hope of true redemption, what else are you going to write? Who/What is going to reward the hero for being good when “right” and “justice” are relative? These are costumed vigilantes taking the law into their own hands with no sense of honor as opposed to heroes assisting police to capture criminals and stand for what is right and good. I like dark, but it has to be well done. I gave up on Sleepy Hollow about 3 shows into the first season. Arrow made it a bit longer before I got bored with it. Person of Interest and Grimm so far haven’t lost me. Both were getting dangerously close, though. We’ll see how Grimm goes next season without one of the regulars. I won’t spoil it for those that don’t know yet, but it’s not the blond.